Above is my graphic representing the Strength Endurance Continuum. As you can see, when you train intensely for strength your endurance barely improves, and when you train intensely for endurance your strength barely improves. Some people choose to work on both strength and endurance, for example professional basketball players may reach 50% of their maximal strength potential and 50% of their maximal endurance potential. If they had chosen to train as a weight lifter they could have reached 100% of their strength potential, and if they had trained for marathons they could have reached 100% of their endurance potential. Strength trainees often ask whether low reps or high reps is better. Well through scientific experimentation, there is a proper answer to that question. One study compared low, medium and high reps over an 8 week, 2-3 times per week leg training program. 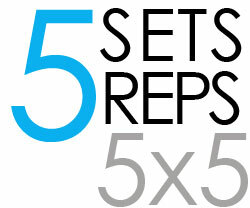 That is, 3-5 reps for 4 sets, 9-11 reps for 3 sets and 20-28 reps for 2 sets. The results showed the greatest strength increase in the low reps group, hypertrophy in the low and medium reps groups, and improved muscular endurance in the high reps group. The conclusion in clear-cut; if you want hypertrophy or strength, then stick to low reps, if you want endurance then go with high reps. Since high reps resulted in little strength increase, and low and medium reps resulted in no endurance gains, to achieve both strength and endurance would presumably require alternating between periods of low reps then high reps. That could be 1 month of low reps, then 1 month of high reps, or 3 months then 2 months or anything you decide. So if somebody asks you whether low reps or high reps is better, you can tell them that 3-5 reps for 4 sets provides by far the greatest strength gains, and 20+ reps for 2 sets results in almost no hypertrophy at all. Tell that to the guys bicep curling 50 times. 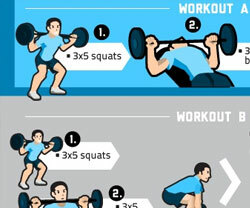 They may dispute you saying that they have had gains already, but with low reps they would have progressed much faster. One Response to "The Strength Endurance Continuum"